The One-Year Myth | How Do You Do It? Toddler Thursday: Welcome to Year Two with Twins! You’re totally onto something: lower the expectations and the margin for disappointment lessens. Mine are almost 3 now, and we still rarely go on outings with them unless it’s a) fun for them, b) a visit to a house with people that can help me or c) absolutely necessary. I save errands, grocery trips, pretty much everything else for evenings and weekends when my partner is home! It makes my time at home with them more focused and gives me the energy to sustain their hijinks. but I do promise, easier is coming! mine play together for a good 30-45 minutes uninterrupted sometimes! Thanks, Sarah! Totally helps to know that others struggle with getting out of the house, too! Mine are almost 3 and half and although they play very well together most of the time trips out beyond a quick trip to the corner store or local park often require two adults, sometimes three or more. You are doing great! 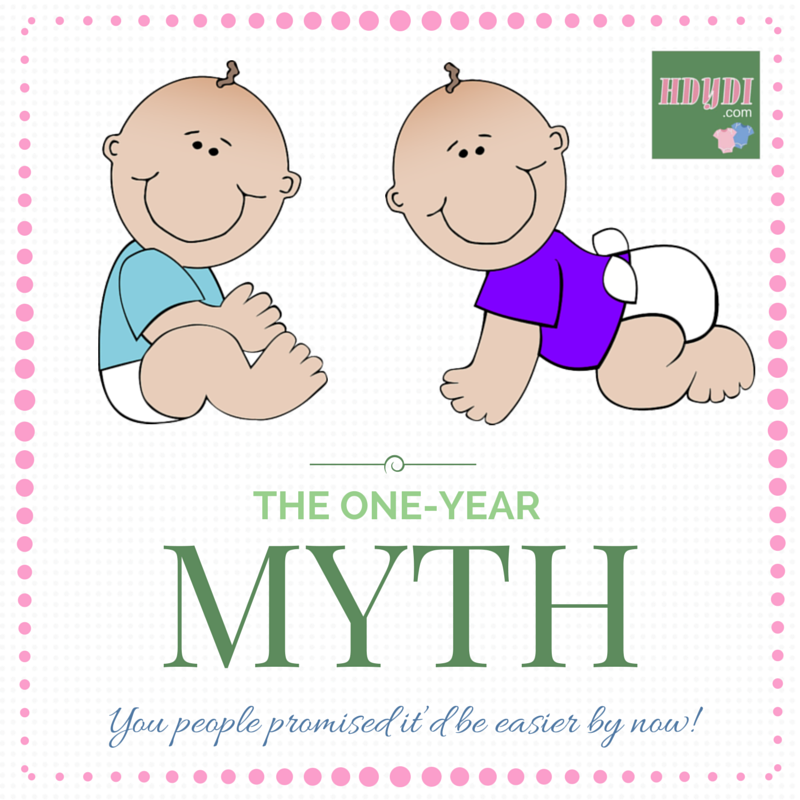 I am guilty of spreading this “myth”… I TOTALLY felt like the skies parted when they turned 1! Maybe my first year was just that awful?!? I’m not saying my life is easy. I’m a single mom and my girls are 3. One of them has recently decided that no consequences have any effect on her, nor do they make her feel any remorse. But I can’t even begin to tell you how much easier it is than that first year! It was much easier when they weren’t so mobile. Mine are 27 months, and I am still waiting for it to get better. Some things absolutely DID get better (hello getting to actually eat my own meal since they can feed themselves!!) and some things got so much worse (two twins + two directions + one mom = disaster). My friends with older twins are kindly realistic. They tell me it doesn’t ACTUALLY get better (in fact, it probably gets worse) until they turn four. So, for now, I get through each day at a time, and sometimes I drink wine for dinner. Mine are 4, I hated 18 months!! That being said if your can make it through the first year of twins , you can pretty much handle anything!!! Hang tough!! My twin boys are 4 and half now. 18 months was hard, but the first year was harder, and each month after that got easier and easier. It wasn’t until about 3 1/2-4 years that they really got good at playing together. Now they can entertain each other all day and it is WONDERFUL! I always went out with my twins and their sister who is 18 months older. They’ve always run errands with me since they were newborn, fun or not, and so I guess they (and me) have learned how to behave on our outings so it hasn’t been an issue for me. We gave up the double stroller and always toting around a bag of drinks, snacks, etc. at about 4 years and it feels so liberating! I have a 3 year 8 months old and the twins which are 20 months old… And it is caos but each day it pass it gets better they play a lot with the older sister. Some people told me that I would be relief until their 3rd birthday. In a couple of months I will send them to preschool. I would suggest to get pregnant again and when the new baby arrives your twins will be playing together. For me was difficult and because my older singleton didn’t had someone to play with and some time is because the twins don’t understand the games she wants to play. You’re right….it doesn’t get “easier” per se but just different. On the one hand, it’s easier because they are sleeping through the night. Therefore, so are you! When I had a full-night’s sleep, the next day, no matter how chaotic, seemed a bit easier. So maybe we should change the dialogue and say, it doesn’t get easier but you just get used to it and can handle it better! Yes! Great way to put it! Mine are 3 3/4, and I am only now able to see the light at the end of the tunnel. I, too, avoid taking them out alone, though nowadays it’s easier than when they were younger. They do play together, but they are such different little beings that they don’t have a lot of overlapping interests. I send them to half-day daycare so I can have some peace and quiet, can do chores & run errands, and they can get socialization. It’s wonderful! One year isn’t magic! For me it wasn’t a specific age when it got easier – it was a height! I found that magic time when they were tall enough for me to hold their hands and I could stand up straight. Not only was I no longer hunched over most of the day, now I could have a conversation with an adult and look them in their eyes, or pay a cashier, etc., but at around that time they were old enough to listen and follow simple direction, be interested in things in that were going on around them (not just for them). Oh, and even though they were ‘growing up’ they still took naps! Hang in there! There is a certain magic to each age, but no doubt some are more tiring than others! Thanks! Haha! Good point-that when they’re a little taller many things will be easier. Toddlerhood was hard as they went in separate directions. I only did things where I could take the double stroller. Walk to store and only buy what could fit underneath. When a bit older we could do the obnoxiously huge cars at Safeway. Lifesaver to have a whole cart to fill!! They do start to play with each other more soon and it gets easier but they get into more mischief than one alone, in my experience. If you have a moment to breathe, take pics, even of paint, beads and feathers they “decorate” the rug with. You’ll laugh later. Maybe much later, but you will. Mine are 11 now. Yes! You have it exactly. I had a son before my twin boys, so I thought I had some experience going in, but it is COMPLETELY DIFFERENT! My twins just turned 3, and I can go to the store with them now after dropping my older son at school, but I can’t go anywhere with all 3 unless it’s the park. When my oldest was in a part-time preschool, I would watch helplessly as all the other moms would talk while I had to watch my other two. I didn’t make a friend until the last few months of school, and now that our kids go to different schools, & it’s winter, we’ve almost lost touch too. I’m waiting for spring to plan some park trips for adult interaction. Keep it up – it DOES get better, but at 1, they are still very needy. 2 is better. I have a 4 year old daughter, and 2 year old twin girls – have to say, the 18-24 months bit was definitely getting better…now they’re firmly in the terrible twos though! I distinctly remember at about 8 months though, thinking that with my first (single) daughter, it had just kept getting easier, and with the twins it was definitely getting tougher! Just remember, you’re a twin mum – you have the capacity to endure everything they throw at you!